In this book the author gave priority to food and poverty of four poor countries of the world, one in Asia and the three other in Africa. 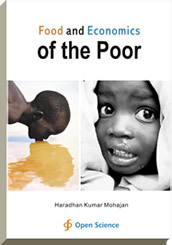 In the final chapter the author has discussed global food price hike and its effect in the poor countries. Bangladesh is one of the poorest countries in Asia. The main causes of poverty of this country are illiteracy and corruption. It is considered as one of the major labor exporting countries of the world. Ethiopia is considered as the poorest country in the world but it is also considered to be one of the oldest nations in the world. It depends on the rainfed agriculture. It is one of the few countries that were never colonized, although it was occupied by Italy from 1936–1941. Zambia is one of the poorest countries in the world and is considered a least developed country. Malnutrition is a chronic and difficult problem of Zambia. The economy of Kenya has been continued to be the largest in the East African region and third largest in Sub-Saharan Africa after South Africa and Nigeria respectively. At present Kenya is one of the most highly literate countries in sub-Saharan Africa. An Assistant Professor at Premier University, Chittagong, Bangladesh. He received his Master Degree in Mathematics from the University of Chittagong and M. Phil in Theoretical Physics from the same University. He has submitted his PhD Dissertation in Mathematical Economics and Social Science in January 2012 in the same University. He has 63 published papers in the reputed journals. He has also 17 published books and 1 book to appear. He is a member of American Association of International Researchers (AAIR) and advisor of Hasnabad Graduate Forum. He is also the reviewer of many reputed journals. Core audiences of the book are researchers of under graduate and graduate programs. The common students can also read the book. The market of the books is worldwide but the readers of the developing countries will be gained more from the book. Some common people who are related to the field can read the book.